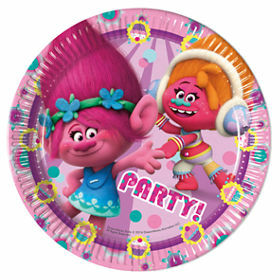 Trolls Paper Party Plates from the Hit 2016 Animated Movie Trolls we have some great party plates ideal for any girls dream Birthday parties. That being said these are also very popular for boys too who have proven big fans of the films. These plates are ideal to set the table at your next Birthday Party going nicely together with Trolls Party Cups, Napkins and why not get the party started with Trolls Invites too. The plates are 23cm (9 inches) Diameter a nice size to fit a healthy portion of buffet food. Different from other movies where music complements the story of the film. Trolls, the music is an integral part of the story and helps to tell the story.